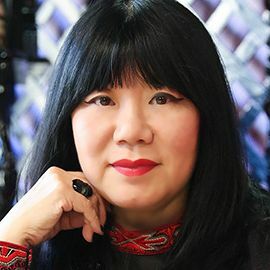 Anna Sui is an American fashion designer from Detroit. She was named one of the "Top 5 Fashion Icons of the Decade" and in 2009 earned the Geoffrey Beene Lifetime Achievement Award from the Council of Fashion Designers of America (CFDA), joining the ranks of Yves Saint Laurent, Giorgio Armani, Ralph Lauren, and Diane von Furstenberg. Her brand categories include several fashion lines, footwear, cosmetics, fragrances, eyewear, jewelry, accessories, home goods and a gifts line. Anna Sui products are sold through her free-standing stores and distributors around the world in over 50 countries. In 2006, Fortune estimated the collective value of Sui's fashion empire at over $400 million. Fashion Designer & Judge on "Project Runway"